Students, families, staff, and members of the Klein community gathered early on a chilly and dry Saturday morning to take part in the inaugural Krimmel Intermediate Color Run. 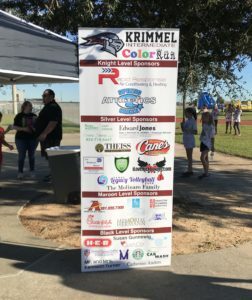 Sponsors for the inaugural Krimmel Color Run. The event was held to raise money for the Krimmel PTO which supports innovative projects and ideas at the campus and in the community. The original goal was to raise $6,000. Krimmel Principal Prentis Harper expressed his appreciation for everyone involved as he ran with the students. Harper said that this event was one more way Klein ISD is working to build community as part of the Promise2Purpose shared vision. Learn more about our shared vision at https://kleinisd.net/vision.